Joseph Kekuku (1874–1932) is the inventor of the steel guitar. Kekuku was born in Lāʻie, a village on the island of Oʻahu, Hawaii. When Joseph was 15, he and his cousin, Sam Nainoa left for a boarding school in Honolulu. In 1889 while attending the Kamahameha School for Boys, Kekuku accidentally discovered the sound of the steel guitar. "Joseph told me that he was walking along a road in Honolulu 42 years ago, holding an old Spanish guitar when he saw a rusty bolt on the ground. As he picked it up, the bolt accidentally vibrated one of the strings and produced a new tone that was rather pleasing. After practicing for a time with the metal bolt, Joe experimented with the back of a pocket knife, then with the back of a steel comb and still later on with a highly polished steel (bar) very similar to the sort that is used today." In 1904 at the age of 30, Joseph left Hawaii and would never return. He started in the United States by performing in vaudeville theaters from coast to coast. His group was "Kekuku's Hawaiian Quintet" and were sponsored by a management group called "The Affiliated." In 1919, Kekuku left the U.S. for an eight-year tour of Europe traveling with "The Bird of Paradise" show. "The Bird of Paradise" show started on Broadway, and was well-received in Europe. 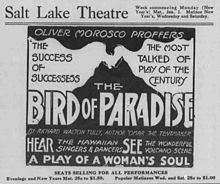 "The Bird of Paradise" was so popular that it became a film in 1932 and again in 1951, though Kekuku was not in either film. Kekuku eventually returned to the United States and, at the age of 53, settled in Chicago and ran a popular and successful music school. In 1932 Joseph Kekuku lived in Dover, New Jersey with his wife and gave Hawaiian guitar lessons. On January 16, 1932, at the age of 58, Joseph Kekuku died in Morristown, New Jersey, of a cerebral hemorrhage. Kekuku is buried in the Orchard Street Cemetery. In 1993, Joseph Kekuku was inducted into the Steel Guitar Hall of Fame with full honors as the inventor of the Hawaiian steel guitar. A statue of him was erected at the Polynesian Cultural Center in Hawaii in 2015. ^ "Kekuku's Hawaiian Quintet". digital.lib.uiowa.edu. Retrieved 2018-05-11. ^ Garrett, Charles Hiroshi (2008). Struggling to define a nation : American music and the twentieth century. Berkeley: University of California Press. p. 180. ISBN 9780520254862. OCLC 219568840. ^ a b c d e Ruymar, Lorene. "The Hawaiian Steel Guitar and Its Great Hawaiian Musicians", via Google Books. Centerstream Publications, 1996. ISBN 1-57424-021-8. Accessed November 23, 2008. ^ "Hawaiian festival to honor Joseph Kekuku and steel guitar" (PDF). Ye olde tye news. Dover Area Historical Society. 35. Fall 2004. ^ "Polynesian Cultural Center Unveils Statue of Joseph Kekuku, Inventor of the Hawaiian Steel Guitar - Go City Card". www.smartdestinations.com. Retrieved 2018-05-11. This page was last edited on 7 February 2019, at 17:43 (UTC).